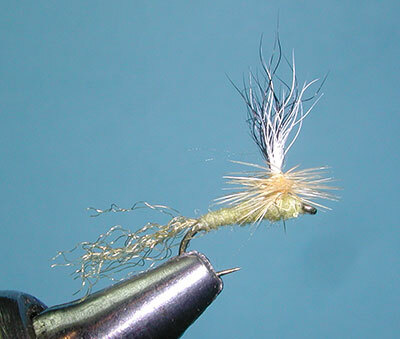 Notes: The Bivisible Dun is a mayfly emerger pattern that was designed by Sierra Flyfishing guide Ralph Cutter of Nevada City, CA. The Bivisible Dun has no resemblance to the more reknown Bivisible. The Bivisible is an attractor dry that is tied with two palmered hackle, the front hackle usually being a lighter color, often white.The only reason Ralph used the name Bivisible Dun is due to the two color post of white and black calf tail. 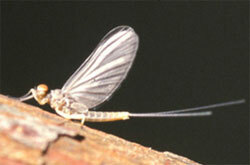 Having this two-tone wing post can be a great advantage when the fly moves into and out of shadows. One or the other colors will stand out. The two-tone wingpost is also an advantage during a massive hatch where it distinguishes itself to the flyfisher from amongst the actual duns. Ralph incorporated the characters of certain patterns and brought them together for this one. It tends to have the sillouette of a Sparkle Dun with it's Zelon tail and tapered dubbed body. The post and parachute characteristics come from a Parachute Dun. Although Ralph's pattern calls for White and Black Calf hair for the wingpost, I find that substituting Turkey Flat is a much easier material to work with, as does A.K. 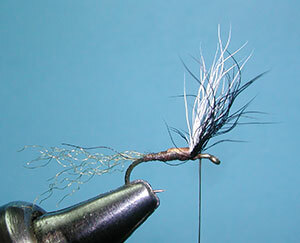 Best with his Quilled Parachute Dun pattern. The Bivisible Dun works well on many baetis hatches. The Zelon trailing shuck will help to submerge the pattern since it will absorb water while the parachute hackle keeps the upper portion of the fly within the surface film. 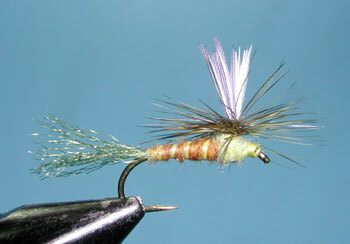 Ralph has tied them to size 10 for Green Drakes and down to size 24 for small caenis. Many parachute dun patterns use a standard Dry fly such as a TMC 100, Ralph prefers the TMC 9300 which is a heavier wire and helps sink the rear portion of the Bivisible Dun.